Well after a few setbacks, I finally made it to my mom's in Alabama at 11:30 Saturday night. Yesterday I helped my friend Bekah add the finishing touches of accessories and art to her adorable new home, and today I'm tackling some projects at my mom's...or at least trying to. There are two things I'd really love to complete by the end of the week. The first is to paint the formal dining room a gray color. The picture below is my main inspiration. 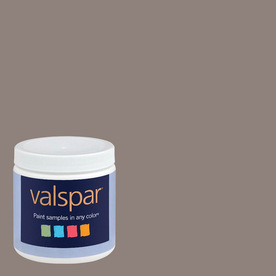 I went to Lowe's and got samples of a few different colors, and after seeing them all up on the wall, I think I've decided on Mountain Smoke by Valspar. I think this tone of gray will work well with my mom's furniture and gold framed oil paintings, and I love having the idea of adding a dark color to this room (which is currently cream) because it evokes a more intimate setting for dining. So the dining room color was decided. Easy enough, I thought. Then came the kitchen. It's a whole other story. P.S. If any of you have great tips on removing wallpaper, I am all ears! We bought some wallpaper removal gel at Lowe's, but it's just not gettin 'er done.